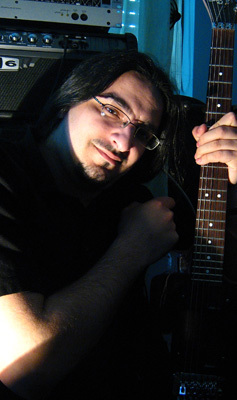 Aleksandar is one of the “Anguish Sublime” founders, main composer and guitar player. He started making music in the end of his elementary school, back in 1991, composing “game intro”-like tunes in trackers on the legendary Commodore 64. After few years he switched to a new toy – Amiga 500 – using the famous “Fast Tracker”, which gave him a possibility for creating more complex music and an opportunity to use samples of drums, bass and keyboards. He started to learn/play guitar at year 1994, with no previous musical education (that he doesn’t have still). All of that undoubtedly led to creation of first metal and hard rock tunes, and by simple mixing techniques most of them ended being recorded on many tapes, and some of them evolved into “Anguish Sublime” songs. Before founding “Anguish Sublime”, Aleksandar “played” a keyboard/computer samples (amiga 500) in hard rock / metal band from Temerin called “Raspad sistema”, that had several live performances and no recordings. Soon after disbandment of “Raspad sistema”, Aleksandar continued the work on his own themes/tunes, that will soon become the basis and first songs of future joint project with Árpád – “Anguish Sublime”. In the band, Aleksandar was the also responsible for all the recordings, mixing and mastering. Besides music work, he’s did all of Anguish Sublime’s net-worx (website, myspace, etc), as well as for all graphic works, except for AS logo(s) (which were created by Árpád). During the work in “Anguish Sublime”, Aleksandar also worked on some of his own, non published, and non-metal tunes. inspired mostly by his love for epic fantasy and science fiction. You can hear some of by playing them in the player bellow.